Each year, Rivals assigns a rating or points value to each school that describes the talent of the players who signed a letter of intent. For Sports Illustrated, we developed a model that takes the Rivals ratings and predicts future team performance. To compare the rankings from this model with the preseason AP poll, we looked at which rankings better predicted the final AP poll. The Rivals model did as good or better than the preseason AP poll on 46 out of 100 teams over the last 4 years. This is remarkable given the limited information the recruiting model has compared with the writers that vote in the AP poll. 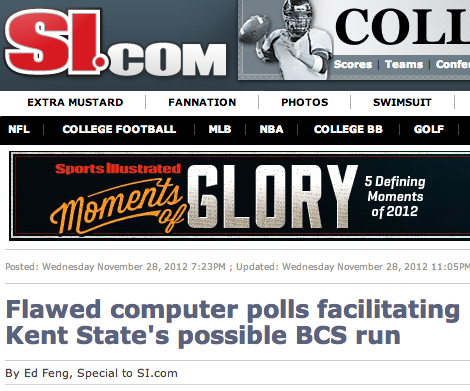 To get the full story on SI.com, click here. Before we count down the top 25 teams for 2013, we note the following about this regression model. The regression model has learned from the past by relating recruiting ratings to the team ratings from The Power Rank algorithm. For example, recruiting data from 2009 to 2012 were fit to The Power Rank’s results for the 2012 season. Our team ratings from the regular season have picked the winner in 62.8% of bowl games over the last 11 years, a better percentage than the Vegas line (62.2%). Part of the accuracy of the recruiting model depends on our team ratings. We used the final AP poll as the measuring stick for the accuracy of the Rivals model and the preseason AP poll. This poll has problems, as it strongly considers wins but almost ignores margin of victory. 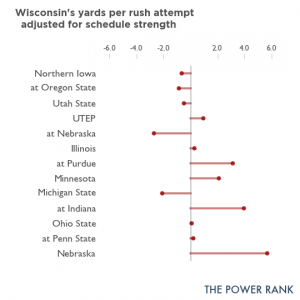 However, it was the most relevant measurement of team strength for a general college football audience. The 100 teams we looked at were the top 25 teams in the preseason AP poll over the last 4 years. This puts the recruiting model in a better light, since this set of teams didn’t include teams highly ranked by the recruiting model but outside the AP top 25. For example, the recruiting model had Auburn 7th heading into the 2012 season. The preseason AP poll had Auburn 28th, which more accurately predicted their disasterous season. With the passing of National Signing Day 2013, we now have the Rivals ratings to predict the 2013 college football season. The predictions are based the past 8 years of team performance. 25. Stanford. The Cardinal only had 12 scholarships to offer incoming freshmen. Since the number of recruits directly affects the Rivals team rating, Stanford only had the 61st ranked class this year, a far cry from their 5th ranked class a season ago. 24. Miami (FL). Miami coach Al Golden can’t walk off campus without tripping over a highly touted high school player. However, impending NCAA sanctions made recruiting difficult this year, as they had the 44th best class, much worse than their 9th ranking a year ago. 23. Virginia Tech. Despite two down years, coach Frank Beamer still recruited the 22nd ranked class. The Hokies need QB Logan Thomas’s passing to improve or groom a better passer. 22. California. The Bears continue to recruit well despite the coaching change from Jeff Tedford to Sonny Dykes. However, this ranking is probably too high. The Cal offense will be learning a new spread system under Dykes, while the defense lost coordinator Clancy Pendergast to USC. 21. Washington. The Huskies have continually improved their recruiting rank over the last 4 year, rising from 28th in 2010 to 18th in 2013. Hopefully, some of the linemen recruiting during this time will give QB Keith Price better protection next season. 20. Nebraska. The Cornhuskers pulled in the 17th best class, by far the 3rd best class in the Big Ten. Unfortunately, Michigan and Ohio State were way ahead, and Nebraska has to travel to Ann Arbor this season. 19. South Carolina. With all the media chatter about the talent in Columbus and the draw dropping hits from Jadeveon Clowney, you might think South Carolina is a top 10 recruiting team. In reality, their 16th ranking in 2013 was their best over the last 4 seasons. 18. Tennessee. The Rivals model had the Vols 13th in the nation last season, which was way too high. 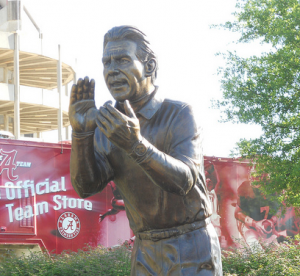 With new coach Butch Jones taking over, this year’s 18th ranking is also probably too high. 17. Oregon. Over the last 4 years, the Rivals model has consistently underrated the Ducks. The preseason AP poll was more accurate each year. Will this continue after head coach Chip Kelly handed the program over to Mark Helfrich? 16. UCLA. In talent rich Southern California, the Bruins always recruit well. They finally lived up to that talent last season under first year head coach Jim Mora. Their 11th ranked class this year should continue this trajectory. 15. Texas A&M. New coach Kevin Sumlin is getting tons of credit for recruiting the 10th best class this year. Of course, it helps that Johnny Manziel (a 3 star recruit) led the Aggies to their best season in more than a decade. 14. Mississippi. The Rebels and coach Hugh Freeze had a magical signing day, landing two top 10 recruits on the offensive and defensive line. Their 7th ranking is by far their best since 2002. However, three of their rivals in the SEC west are ranked higher in these rankings. 13. Clemson. With their dramatic, come from behind win against LSU in the Chick-fil-A Bowl, the Tigers will surely be an overrated top 10 team in the preseason AP poll. This ranking in the teens seems more appropriate. 12. Oklahoma. In the past 12 years, the Sooners have recruited a top 10 class 7 times. However, none of these top 10 classes have occurred during the last 3 seasons. Coach Bob Stoops needs more talent on the defensive line to start contending for national titles again. 11. Texas. Even Mack Brown can’t recruit after 3 subpar seasons. The Longhorns had the 23rd ranked class, their worst since 2002. Their usually excellent defense really needs help after last season. 10. Georgia. How would the Bulldogs recruiting class would have fared if the coaches had told QB Aaron Murray to spike the ball during the waning moments of the SEC championship game? A win over Alabama would have landed Georgia in the national title game against Notre Dame. Instead, they had the 12th best class, a fine rank but the second worst for coach Mark Richt over the last 12 years. 9. Michigan. After a disasterous 3 seasons under Rich Rodriguez, Brady Hoke has turned around this program both on the field and recruiting trail. The Wolverines notched the 5th ranked class after finishing 7th last year. These are their two best ranked classes over the last 8 years. 8. USC. While we kept hearing about the defections from the Trojan’s class, no one mentioned that coach Lane Kiffin still had five 5 star recruits coming to campus, more than any other school (yes, even Alabama). Lack of talent will not be a problem for USC. 7. Auburn. Yes, feel free to call BS on this one. The Tigers continue to recruit well. But unless the next Cam Newton and Nick Fairley show up on campus this fall, Auburn will not return to elite status this season under new coach Gus Malzahn. 6. Florida State. Call BS on this one at your own risk. Despite disappointing loses to NC State and Florida this year, expect the talent rich Seminoles to exceed expectations next season. 5. LSU. It’s a bit shocking that top recruit Robert Nkemdiche picked Ole Miss over LSU. There’s more certainly in winning games in Baton Rouge. Still, coach Les Miles landed the 6th best class in the nation. 4. Notre Dame. The Fighting Irish took full advantage of their undefeated regular season and landed the 3rd best class in the nation. While we should expect Notre Dame to be good next year, 4th is probably too high. 3. Ohio State. The Buckeyes will not surprise anyone this year. In coach Urban Meyer’s first season, Ohio State started the year 18th in the preseason AP poll. 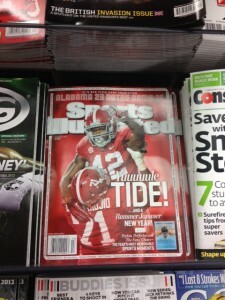 Now, with an undefeated season and a 2nd ranked recruiting class, anything but a national title will be a disappointment. 2. Florida. Last year, first year coach Will Muschamp landed the 3rd ranked class despite finishing 7-6. Somehow, a 11-2 season this year got the Gators the 4th ranked class (although they did top the rankings before National Signing Day). Talent is never a problem at Florida. 1. Alabama. Duh. What did you expect? After going 7-6 in his first year at Alabama, coach Nick Saban still recruited the top ranked class in 2008. 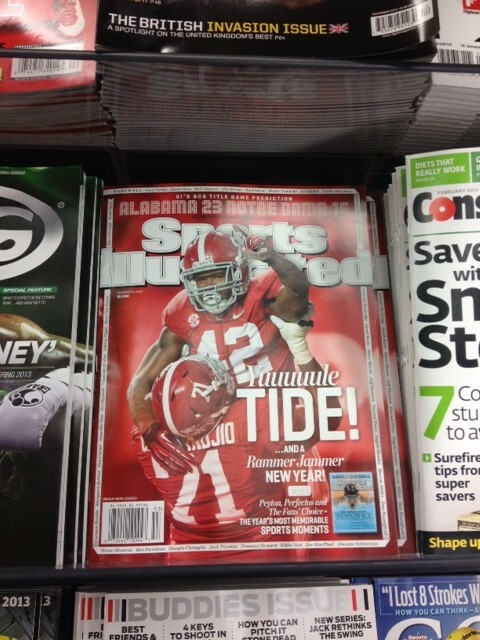 This started a streak of top ranked classes for Alabama in 5 of the last 6 years. The rest of the SEC should resort to a voodoo consultant to bring bad turnover luck to Alabama next season. No one should take these rankings too seriously. With the short season and the youth of the players involved, college football is incredibly difficult to predict during the preseason. And these rankings have their problems. There’s an incredibly high likelihood that Boise State will be better than the 60th best team in the nation next year. However, these rankings are still useful, and not only because they are six months ahead of the preseason AP poll. As with all predictive analytics, use these rankings has a guide to help navigate expectations for next season. Moreover, this is only the beginning of our preseason college football predictions. To keep up to date, sign up for our free email newsletter below. I had the honor of being on Paul Finebaum’s radio show yesterday. Paul talks college football all year long from Birmingham, Alabama, and the New Yorker recently titled their profile of him “King of the South”. In prepping for the show, I was blown away with the engagement he has with his callers. He lets them say almost anything, making people like Tammy and Legend the stars of the show. He even traveled to Iowa to visit Robert from Waterloo, a frequent caller with cerebral palsy. Talking about Stanford’s Rose Bowl win and how the team rankings predicted the 6 point win. Saying “computer code” in an interview on college football. And if a team is predicted to win by 1 point, they have a 52.4% chance of winning, not the 53% I mention on the show. The BCS calculus for Notre Dame is simple. Beat USC on Saturday and play in the national championship game. Can the Fighting Irish do it? Most of the headlines focus on Notre Dame’s defense. Led by linebacker Manti T’eo, the Fighting Irish have allowed 10.1 points per game, best in the nation. With the injury to USC quarterback Matt Barkley, Notre Dame’s defense will most likely have a good day. But what about Notre Dame’s offense? The raw statistics suggest Notre Dame has a poor offense. For example, the Fighting Irish pass for 211 yards per game, a number that includes negative yards from sacks. Their 74th ranking places them below average nationally. However, total yards per game is a misleading statistic. Yards per game depends on how many times a team throws the ball. Notre Dame doesn’t throw the ball as often as the spread offense of West Virginia. Using simple division, we divide total pass yards per game by the number of attempts to obtain a better metric of pass offense. Notre Dame averages 6.83 yards per pass attempt, 51st best in the nation. Simple division turns a below average pass offense into an above average one. Dividing total yards by the number of plays lets us account for the pace of the football game. It is analogous to the tempo free statistics that Dean Oliver introduced into basketball. Looking at points per possession shed a new light on offenses that didn’t fast break and looked for the best possible shot late in the shot clock. Yards per attempt is the first step in incorporating these ideas into football. 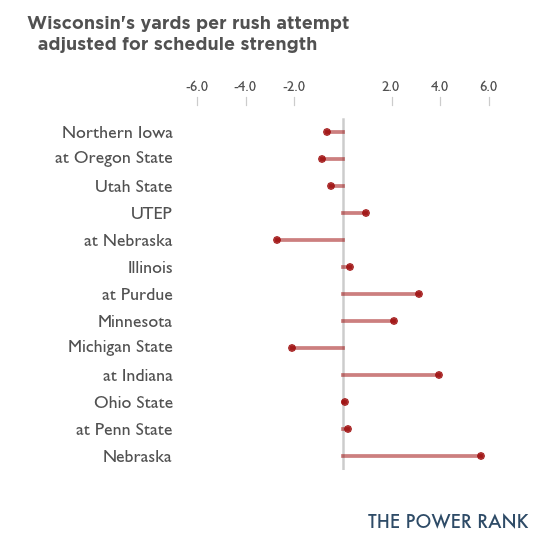 At The Power Rank, we take yards per pass attempt and adjust it for strength of schedule. Since Notre Dame has played top pass defenses such as Stanford, Michigan State and Oklahoma, our algorithm bumps up their pass offense from 51st to 28th. Their rating of 7.04 gives a predicted yards per attempt against an average pass defense. Below, we show how our adjusted numbers for Notre Dame’s offense match up with USC’s defense. A better defense has a blue dot further to the right. Then the unit with the dot further to the right is predicted to have the advantage in the match up. 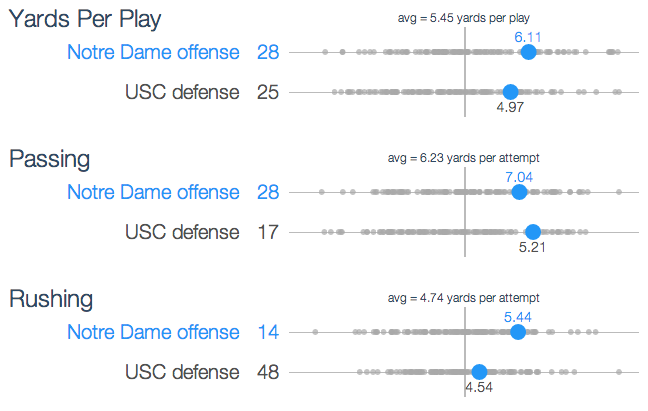 By overall yards per play, Notre Dame’s offense enjoys a slight advantage over USC’s disappointing defense. These visuals appear on our interactive team pages, the heart of our premium college football product. For more information, click here. Our team rankings predict a very even game (USC by 0.3 points). However, these numbers reflect a USC team with quarterback Matt Barkley. The Vegas line has Notre Dame as a 6 point favorite. Is the injury to Barkley worth 6 points? We’ll find out Saturday.